Meet our dog, Ritter. All dogs are special, but Ritter is special in a different way. 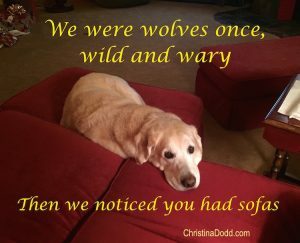 In 2003, my husband suggested we train an assistance dog for Canine Companions for Independence, an organization that provides assistance dogs for children and adults with disabilities. We knew it would be a lot of work, but the reward is providing a dog to help someone in a wheelchair live a full, joyful life. CCI breeds an d provides the dogs. Ritter was our assignment. We got him when he was eleven weeks old and hell-dog. The first thing we were told about him was that he’d eaten a towel and we should watch to make sure he’d pass it. (It’s stuff like this, folks, that makes me realize that I’m the living embodiment of glamor.) He wrestled with our own personal dog, Lizzie, who didn’t understand why she wasn’t still an only dog. We had to teach him over thirty commands including “Visit” which had him put his head into your lap so you could pet him and “Hurry” which was the “go to the bathroom” command. (Yes, glamor! I’m surrounded by glamor!) We took him to restaurants and to grocery stores to teach him how to behave in public. He wore his vest, and he grew into a wonderful, sweet, polite dog who everyone loved and who would be a great companion to anyone in a wheelchair. 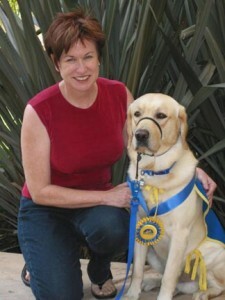 In August 2004, when he was nineteen months, we took him to San Diego for advanced training at CCI. Walking away from him was a gut-wrenching moment. My husband tried to be stoic and said that we’d sent two children to college and this wasn’t any different. I knew Ritter, and it was different — I knew he would never call or write. We got monthly reports from his trainers telling us how he was doing, and while they always said he was smart and wanted to please, they were concerned about how excitable he was and that he had a fear of (don’t laugh) Care Bears. (You’re laughing!) Yes, it’s true, Ritter was afraid of large fuzzy mascots like the ones at ballgames or who attend grocery store openings. 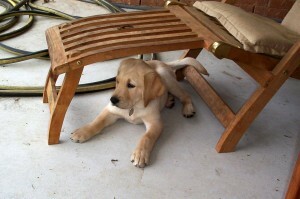 As you can imagine, that won’t do for an assistance dog who has to be prepared to go everywhere. So after five months of advanced training, we got the call. Our little boy had flunked out of college. We went down to San Diego to get him, got to CCI and signed adoption papers, then the lady said, “We have a reunion ritual.” The ritual consisted of my husband and I standing in the hallway while everyone who worked there came out and watched. She brought Ritter out, released him, we called him, and he came over and very cautiously sniffed us. Then he realized who we were and he was hysterical with joy. He wiggled his whole body for five minutes, kissed us, rubbed us, loved us. Everyone was laughing and commenting about how happy he was and we were pretty happy, too. I cried like a baby. I have to tell you, except for my kids when they were three months and they smiled at me for the first time, no creature has ever been so obviously happy to see me. Ritter was thrilled to leave with us (although he was very affectionate with his trainer), settled down in the car, and we petted him all the way back to Washington state, about 1300 miles. 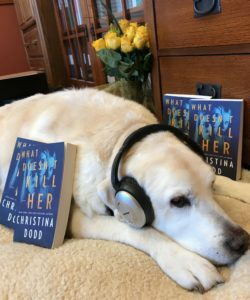 Ritter listens to WHAT DOESN’T KILL HER in audio! So Ritter gets to just be a dog and wrestle with Lizzie (who we have since lost.) At the same time, Ritter wants to assist us. He picks things up for us, he “visits” with his head in our laps, he still snores loudly (okay, that’s not assistance but it’s awfully cute.) , For the price of head rubs and treats, Ritter does publicity for me; he has listened to all my audio books including WHAT DOESN’T KILL HER. As of this writing (January 2019), he’s 16 years old(! ), an extraordinary age for a large dog. He has lumps. He groans when he stands up, but he still takes my husband for a walk every morning. He sleeps in the sun. He can’t hear us tell him that we love him, but we do it anyway. When he climbs the stairs, my husband and I follow him, hands on his rear, steadying and boosting him. The Husband says we are now Ritter’s assistance humans. While Ritter would have been a wonderful assistance dog to the disabled, in all his life, he has never met a stranger; he loves everyone and everyone loves him. He is an ambassador of unstinting kindness to every man, woman and child he meets. He brings happiness with him wherever he goes. I think that is a great gift … maybe the most important gift that a dog can bring us. Join my mailing list for book updates, sales and contests. Download my updated book list sorted by genre, series and in order. Read the newsletter about Ritter’s passing. 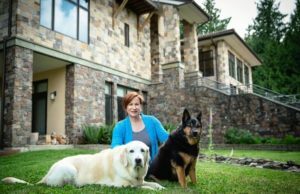 Canine Companions for Independence (CCI) is a wonderful organization that has provided assistance dogs free of charge to recipients since 1975. To raise and train a puppy is a ton of work, but so rewarding! And of course if you donate, you’ll be helping someone whose life will be greatly enhanced by having an assistance dog. 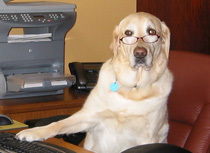 If you’d like to know more about Canine Companions for Independence, visit their website.